Dave Gannon / Digital Strategist / Social Media / Photographer: You can't cover Halloween yet, Mister Winter! You can't cover Halloween yet, Mister Winter! 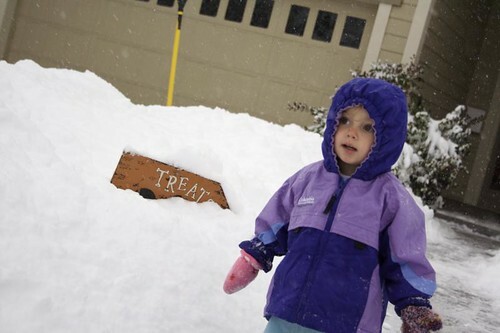 I loved that the Treats sign STILL has not been completely covered. I have watched the snow inch closer and closer to the top but even today after another 8 inches, she still is holding her own. This jacket, however may be Hadley's only costume if it doesn't warm up by Saturday.